Václav Rubeška studied at the School of Applied Arts in Prague, with a major in Artistic gilding. His background as a leading artist in gilding manufacturing paved his way into his current work for knupp gallery. Václav creates iron and bronze hammered and welded sculptures. His specialty area is the anatomy of animals. His sculptures seem to come to life charged by their highly dynamic movement. Every muscle is defined and results in a cohesive and impressive body structure. On occasion his studies extend to the human body. 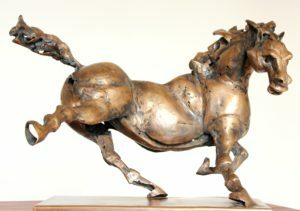 All of his sculptures are made of hammered and welded iron or bronze, each piece is original and unique. Rubeska does not cast any type of metal. Welding and hammering gives his artwork a special quality feature, resulting in every piece making a precise statement of handcraft.